Make up a cluster of these cute polymer clay ornaments, and use some for wreath decoration, or for topping a bow to finish off an especially pretty package! Begin by conditioning the clays. Roll out 1/4″ thick sheets (a #1 setting on an Atlas Pasta roller) of the brown and the red. Cut the red (or pearl white) into quarters and stack. Apply the gold leaf to the top layer–it will stick. Then roll this stack out to a 1/4″ thickness again. This will break up the gold into a mottled pattern. 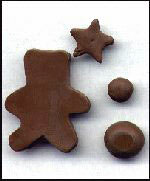 To make bears:Cut out the body shape with the bear cutter.Flatten a piece of the remaining brown clay with your finger to thin, and cut a small star. To make as a hanging ornament:cut a 7″ long piece of the gold thread.Double it, and place the ends on the back of the bear head.Use the small star on top to sandwich it in place.Press into place. Do not pull on the thread until after baking. Place bear face up on your work surface to continue. Use the corner of the star or triangle cutter to indent the ears.Then roll a small amount of the left over brown clay to make 2 balls, one smaller than the other.Flatten them slightly on your work surface, and use the large one to make a bear tummy, and the small one to make a bear snout. Place as shown. Use the toothpick to draw a seam line down the belly, or add a belly button if desired. Roll a very small ball of black to form the bear nose, and place it slightly above center on the snout.Press firmly into place, but do not deform.You can use seed beads for the eyes, or roll tiny amounts of the black clay to form them (seed beads are a quick way to do them in multiples, and use the toothpick to press them into place) Place the eyes above the snout, to either side of the nose. Use the diamond shaped cutter to make the bow tie.Cut one diamond in half, and place with the points touching between the snout and the belly of the bear as shown. Roll a small ball for the knot and place on top of the two points in the center. Use the star shaped cutters. 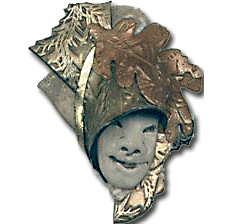 Turn the ornaments over, and cut a 7″ long piece of the gold thread. Double it, and place the ends on the back of the star. Cut a small star with a thinner piece of clay, and use it on top to sandwich the thread in place. Press into place firmly. Do not pull on the thread until after baking. Turn star over to face up, and use your finger to “pet” the clay and smooth it if needed. Bake on a piece of paper on a baking pan according to clay directions. I bake for 30-45 minutes in a 280 F. degree oven. Some clays bake at slightly lower or higher temperature, so check your package directions. 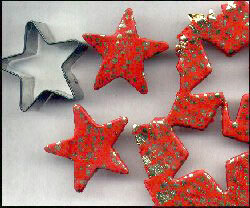 When cooled, paint a small amount of Varathane over the star ornaments and the bow ties. This protects the gold leaf. 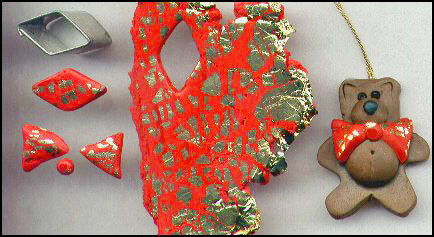 It also brings out the luster and intensifies colors. 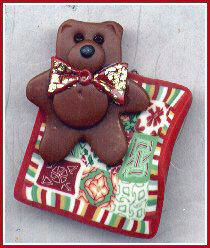 Bears can be used on wreaths, or placed on slices of quilt block canes.